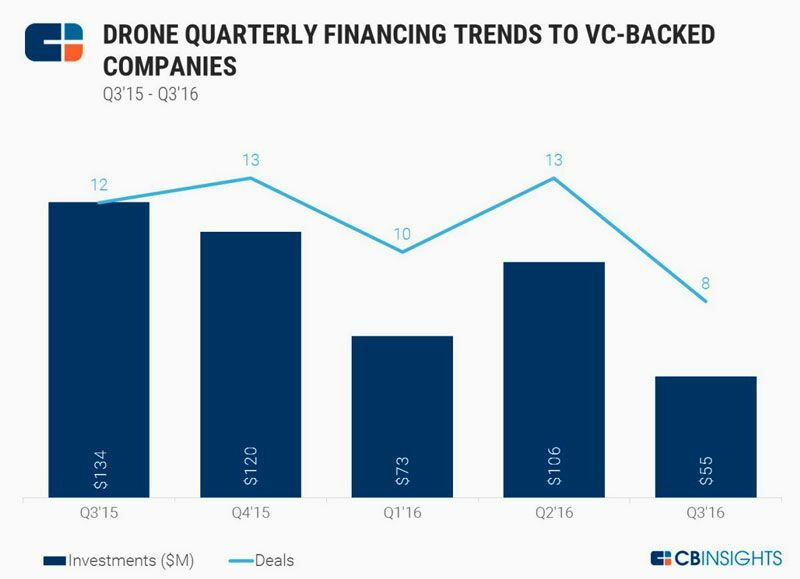 CB Insights Drone Quarterly Financing Trends to VC-Backed Companies shows a downward trend. The Robot Report’s monthly funding reports show something different: a change in the nature of drone applications getting funded. According to CB Insights, there was $55 million invested in eight VC deals for the drone industry in the third quarter, compared with almost $106 million invested in 13 deals in the second quarter. In the third quarter of 2015, $134 million was invested in 12 drone-related companies, part of a banner year for drone startups. In The Robot Report’s July, August and September monthly funding reports one can see a marked change in the type of drone-related company funding from previous months: all are applications-related and none are for the construction of drones. Many of those companies funded use DJI drones for their applications. The Drone Racing League raised $12 million for drone racing contests. Intel acquired Movidius for an estimated $400 million. Movidius’ vision chips and systems are now flying and avoiding collisions in DJI drones. Airobotics, an Israeli startup, got $22.5 million to scale up production of their inspection drones for industrial mining, sea ports, oil and gas and other industrial facilities. DroneDeploy secured $20 million for their app that flies drones and collects data to make maps and models for ag, construction, facility inspection and mining. Mavrx got $22.4 in two different funding rounds. Mavrx is a service provider using drones and software to collect, analyze and prescribe actions for farmers. MicaSense raised $7.4 million. They are an integrator of sensors and analytics software which they make for drones that they resell. PRENAV raised $6.5 million in seed funding for their vision-guided infrastructure inspection drones. Flyability raised $4.3 million for their safe drones for inaccessible places inspection. Appolo Shield got a small seed round for their drone forensics and shielding software and device. Saildrone raised $14 million for their ocean data collection drones. Autonomous Marine got $1.6 million for their data collection drones which they operate as a service provider. As the drone industry gets over the fun of flying and separates into two distinct domains: (1) consumer-friendly flying cameras and (2) the business of providing data from overhead for a variety of business purposes, one can see the commoditization process happening: manufacturers of drones are consolidating and service providers are proliferating. This is what is showing up in the funding reports and also the news as companies that attempted to do it all rejigger themselves to become service providers and/or value-added resellers. 3D Robotics is an example of the latter.